Welcome to the work of astrologer and author Edith Hathaway. Her articles and commentary on Vedic astrology have appeared in numerous journals and magazines around the world, and some of her lectures are now available on mp3s with accompanying PDFs. 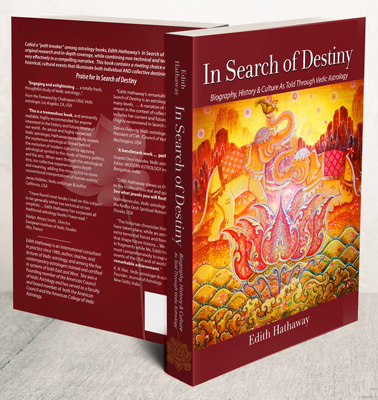 Her most recent book, In Search of Destiny: Biography, History & Culture As Told Through Vedic Astrology was published in April 2012 and is available on Amazon. Read some of the additional Reviews & Testimonials. See Edith’s page at Author Central at Amazon. Deepen your learning experience in Vedic astrology with one or more of the 17 products in Edith’s Web store. With the recent addition of 2 new video presentations from UAC 2018, there are now 3 video presentations (mp4s). The Power Point lecture presentation is combined closely with the mp3 for your convenience. No other venue offers these lectures in the mp4 format. The lecture handout is also included in PDF format and available to download. Enjoy! INTERVIEWS: Please also see coverage of Edith Hathaway in her interviews with Jyotish Star, Oct. 2012 and with the Washington State Astrology Association, May 2011. From April 2017 through Nov. 2017, with follow-up articles in March, July, Aug. and Oct. 2018, Edith has been writing about these events from the vantage point of transiting Pluto tightly opposite the USA natal Sun. In a national chart the Sun symbolizes the President and the presidency. Pluto represents secret forces, unwilling to be seen or identified; and an opposition is a confrontation or attack, in this case a systematic and full force attack, but the players remain hidden – until now. Two Stationary positions of tr. Pluto closely opposite the USA Sun occurred in 2017: April 20, 2017 and Sept. 28, 2017, and another one on Sept. 30, 2018. In its 248-year orbit around the Sun, this is the first time this has happened in the history of the U.S. In the months immediately following the Pluto SD in late Sept. 2017, revelations of events during the tumultuous 2016 U.S. Presidential Election season and its aftermath started to come to light more clearly. As of April 1, 2019 there are 620 pages of articles available at this website: 47 articles including three book excerpts with commentary. 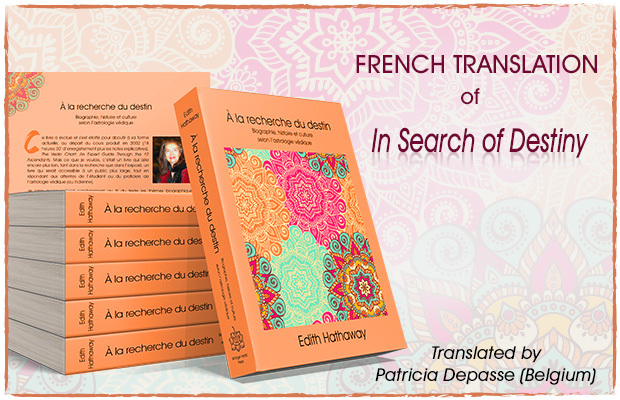 Many of these (21 articles) also appear in French translation by Patricia Depasse, Belgium. Since Aug. 2014 Edith’s articles have appeared in AstroLogic magazine, an on-line magazine, among other venues, both in print and on-line. Among topics of cultural interest, Edith has written on the musical Hamilton, its chief protagonist Alexander Hamilton and its creator Lin-Manuel Miranda. The show’s World premiere was Jan. 20, 2015. She has also written on another noteworthy cultural event: a breakthrough concert Feb. 12, 1924 at which George Gershwin’s Rhapsody in Blue received its World premiere. Edith has also written on the politics of Syria, on ISIS, the U.S. Presidential Elections of 2008 & 2012, and the 2016 U.S. Presidential Election (11 full-length articles, totaling 152 pp. here, here, here, here, here, here, here, here, here, here, and here; also on whistleblowers Edward Snowden and Julian Assange. Several articles focus on the Jupiter-Saturn 20-yr. cycles and conjunction charts, among them, her article on The Information Age (2017) given above, and Corporate Conglomerates vs. Nation States: Which Nations Will Survive & Thrive? (2010) Her article on Graha Yuddha (Planetary War) (2002, revised 2010) is one of the most important and original research articles on the topic. This evokes Edith’s work with the great Vedic astrologer, Chakrapani Ullal, who passed away on Oct. 28, 2017 and will be greatly missed. She writes about him here. Edward Snowden’s revelations in June 2013 about massive global surveillance operations were preceded by whistleblowers William Binney, Thomas Drake and others since 2005. But not until June 2013 did most people pay attention. Edith’s two-part article (available here as PDF) was originally published in the Dec. 2014 and Jan. 2015 issues of Astrologic magazine, an on-line magazine, and later republished with illustrations and follow-up commentary March 2016 in the spring 2016 issue of Geocosmic Journal, a professional astrological journal of the NCGR (National Council of Astrological Research). May 24-29, 2018: Edith was selected by the NCGR (National Council for Geocosmic Research) to give two 75 min. lectures at the United Astrology Conference (UAC 2018). It was held May 23-30, 2018 at the Downtown Chicago Marriott Hotel on the “Magnificent Mile,” Chicago, Illinois. The largest and most important of the international astrology conferences, it was sponsored by five astrology organizations: AFAN, ISAR and NCGR, and their junior partners ACVA and AFA. Speakers were selected from a large pool of astrologers who are members of the various organizations. Edith’s lectures were given on Friday, May 25, 2018, 11:00 am and Monday, May 28, 2018 at 11:00 am. Her Friday lecture “Identifying Revolutionary Trends” was on the Political & Mundane track. Her Monday lecture “Mysteries of the Vedic Dasha System” was on the Vedic astrology track. Audio files of Edith’s lectures are available at the UAC 2018 site, along with handout and Power Presentation for each lecture: http://www.uacastrology.com/. They are also now available at this website (web store) in mp4 format, with audio combined with Power Point presentation. Edith appeared as lecturer and panelist at the ISAR conference Oct. 13-17, 2016 in Costa Mesa, CA, titled “The Power of Forecasting Meets the Consequence of Choice“ – held at the Hilton Orange County Hotel in Costa Mesa, CA. The entire schedule can be viewed at the ISAR’s 2016 symposium website. http://www.isarastrology.org/2016-conference. ISAR (International Society for Astrological Research) coordinated the Vedic astrology track with ACVA (American College of Vedic Astrology). Edith appeared on the 6-member Presidential Election Panel Thurs. Oct. 13, 2016. Coverage of the Oct. 13th Presidential Election panel can be found here. Her lecture and Power Point presentation (1 hr. 18 min.) “Predicting U.S. Presidential Elections” was given on Sat. Oct. 15, 2016. A longer interactive video version of this lecture was done with Saptarishis magazine (Mumbai, India) late on Oct. 20, 2016 (Pacific time) and published Oct. 21, 2016. Click here. There are many forces of destiny for us to understand, and Vedic astrology – the astrology of India – gives us one tool. It is a great gift in revealing who we are, and where we are in time. The next task is accepting and working with those factors. Knowing this and accepting this, we move on to pursuing the destiny we were meant to live, at the highest level – as manifestations of the planetary lights, the brightest of which are the Sun and the Moon. Their light is reflected in each of us. Read a brief overview of Vedic Astrology. “Time is the force behind the Creation of the universal elements. It is also the force that brings about the Destruction of all these. Even when the Universe is Asleep, Time remains in a state of Awakening. Time, which is thus ever alert, is an Inviolable Force. … Time bakes the various living beings along with their souls.” From “The Concept of Time,” Hora Ratnam, Chapter 2, slokas 327-328, p. 309.